Unlike residential lending, commercial investment properties are viewed more conservatively. Most lenders will require a minimum of 25% of the purchase price to be paid by the buyer. The remaining 75% can be in the form of a mortgage provided by either a bank or mortgage company. Some commercial mortgage lenders will require more than 25% contribution towards the purchase from the buyer. What a bank/lender will do is subject to their appetite and the quality of the buyer and the property. If you know what a lender's LTV requirements are, you can also calculate the loan amount by multiplying the purchase price by the LTV percentage. Keep in mind that the purchase price must also be supported by an appraisal. In the event that the appraisal shows a value less then the purchase price, the lender will use the lower of the two numbers to determine the loan that will be made. The Debt-to-Income Ratio compares the amount of bills that the borrower must pay each month to the amount of gross monthly income he earns. 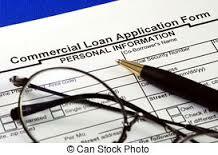 Not much emphasis is placed on this ratio in the commercial lending industry. Most of the emphasis will be placed on the income property's ability to "carry" itself by the income it generates. Net Operating Income is the income from a rental property remaining after paying all operating expenses (Insurance, Utilities, Repairs, etc). Mortgage Debt Service is the annual amount of all periodic payments for interest and retirement of the mortgage loan(s). You will be required to provide a vacancy factor to cover collection loss. Also, lenders will include a management expense of 3-5% of the effective gross income, even if the property is owner-managed. Their logic is that the owner earns that fee, which they would have to pay to others, if they took back the property in a default situation.